Do you want to double the amount of weight and belly fat you lose? Keeping a food journal is a simple way to do it. Studies have shown that keeping a record of what you eat throughout the day can actually help you lose twice as much weight as someone who doesn’t. There’s a good reason for this success: It’s easy to lose track of what you’re actually eating in a day, including the actual portions and the small snacks you grab on the run. So writing everything down keeps your intake in the forefront of your mind. Research indicates that most folks underestimate their caloric intake by as much as 25 to 40 percent. This inaccuracy can have a dramatic effect on your waistline. 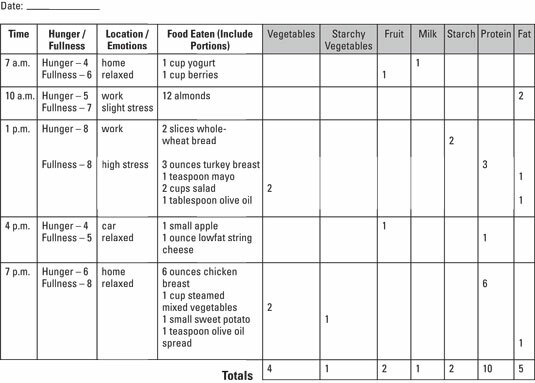 A food journal helps you really see what and how much you’re truly eating. It’s also a terrific way to make sure what you’re eating is balanced. It’s important that you’re eating the foods that help shrink belly fat on a regular basis. And how are you going to make sure you’re doing that? With a food journal, of course! Time of the meal or snack eaten. The location of where you ate, such as at home, at work, in the car, at a restaurant, and so on. Any emotions you were experiencing before you ate, such as stress, frustration, and so on. Keeping track of your food intake helps you see whether you may be consuming too much or too little of a particular food group, whether you’re experiencing any sort of emotional eating, and whether you’re waiting too long and letting yourself get too hungry before eating. Here is an example of a food journal for weight loss clients. It allows you to track the time and location of your meal, your hunger and emotions, the portion size, and the food group your food or beverage falls into. You can copy it and easily keep it with you wherever you go. Following is an example of a completed journal so you can see how it works. 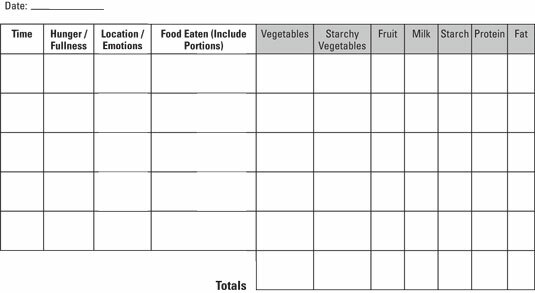 After you complete your food journal, add up your totals to see whether you met your meal plan goals for the day or whether you need to work on certain areas so you can be more in line with your daily goals.